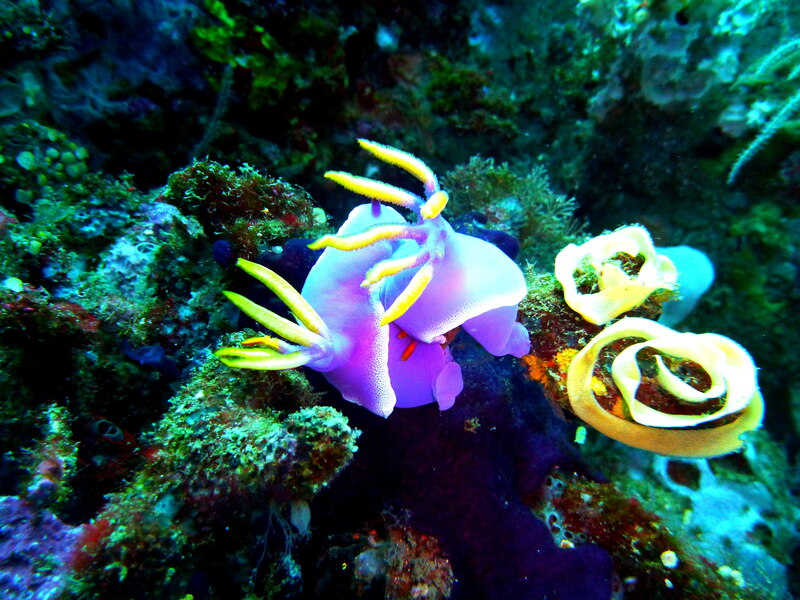 Nudibranch (Nudibranchia) or simply called nudi in diving community are wonderful creatures, with odd shapes and vibrant colors one can’t miss them as it crawls on soft or hard corals among the reefs. They are lovely to behold and if you are sensitive on micro and subtle critters, these animals are exceptional. Generally, it’s not for human consumption – often referred to as “butterfly of the ocean” due to vivid vibrant color and their intense toxicity – generally their loud color is a warning sign! I love nudis and my dive won’t be complete if I don’t find one, I would conclude that the particular reef lacks the necessary as habitat for the critters and so not healthy. And I would reflect that perhaps I went too fast not to notice if there was one. With more than 3000 species, one can imagine how vast and mysterious our ocean can be! It’s one of those sea slug that catches one’s attention due to its striking appearance. The background color is a rich pinkish purple with a white border to the mantle. At the edge of the mantle the border is solid white but inside this is a region of varying width in which the white forms a reticulate pattern gradually merging in to the pinkish purple. The rhinophore stalks and the base of the gills is an intense purple, the rhinophore clubs and the gills are orange yellow. It was mating season I guess, but that was the first time I witnessed this marine critter in such rare intimate moment! Hypselodoris apolegma is its binomial name, a specie of a dorid nudibranch.